Special Talent: Perceiving lies and intentions through reading subconscious emotional reactions. This character was created as an experiment, at the height of my involvement in the My Little Pony fandom I saw a lot of badly designed, badly written fan-made characters. There was this idea that you cannot make something that is interesting and wouldn’t fell into one of the overused tropes. To test or rather challenge that I made Amber. A magical unicorn with a powerful ability, which doesn’t make her overpowered with a not-so-tragic, but still pretty complicated and compelling back story and a complex character with issues which influence her personality. Over time she evolved to become something much more complex, than I originally intended and became a template for at least two other characters. the green tint of her magic sometimes make other ponies suspect she might be a changeling. She’s quite tall for a unicorn and appears to be more athletic compared how slim unicorns usually are. Her tail has a slightly longer shaft with hair that starts to grow only about a hoof-length from it’s base. It’s a pretty rare trait, very uncommon among modern unicorns in Equestria. She also has a tiny scar behind her right ear from a head injury she suffered during her last year in the academy, it’s usually covered by hair. 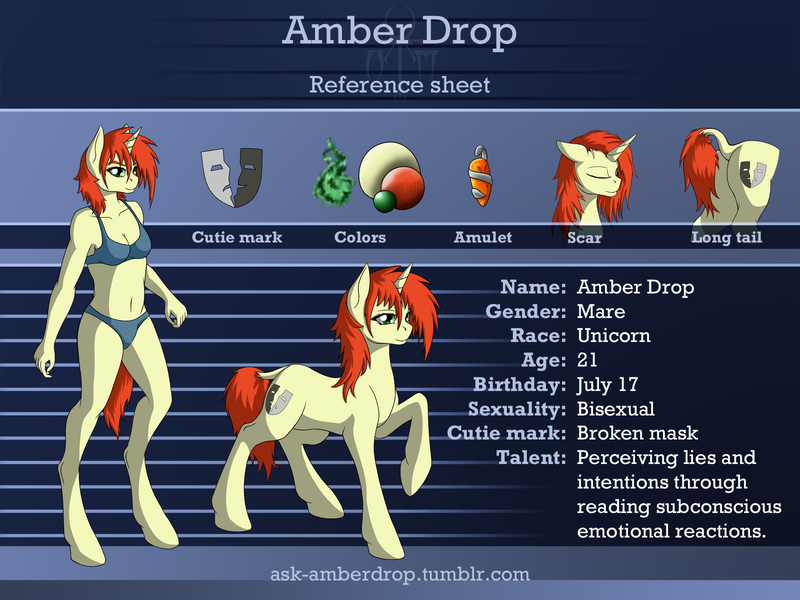 Amber was born on 17th of July in Manehattan to a family of rich merchants. Both of her parents and her younger brother are earth ponies. Her father, Lemon Bite, is a CEO of a trading company in Manehattan that specializes in gems and other rare and valuable resources. He’s a workaholic in love with his job and doesn’t really care for family life. He achieved everything he has by his own hard work and became the owner of a trading company after his marriage with the previous owner’s daughter. On the other hand Amber’s mother, Emerald Dust, never had to work and spent her life partying and spending her father’s riches. Her only desire was to become a member of a noble family. She never got her chance, instead she decided to do everything she could to marry her daughter to wealthy noble from Canterlot. Amber’s younger brother, Lime Slice, became their father’s apprentice since the very young age and is currently working as a junior accountant in the company. He also enjoys music and art, however he has very little time to develop his hobbies. Amber had a rich but lonely childhood. Both of her parents were absent and she spent most of her time with nannies and later with her infant brother. Being raised by servants and limited contact with her parents and other ponies impaired her ability to connect with others. Her special talent started to develop very early in her life and unaware that it is a gift unique to her she started to act on it every time she sensed a lie and dishonesty, which in her parents household was pretty often. This and often punishments for inappropriate behavior caused her to withdraw even more. When she was 7 years old she was sent to The Manehattan Academy for Gifted Unicorns, a boarding school for most talented unicorns, or those who had parents rich enough to afford it. Amber’s magical talent however never developed and she was barely able to use levitation spells. That caused her even more embarrassment and coupled with her non-existing social skills and her lack of control over her special talent quickly caused her to become an outcast who avoided any interactions with her peers. Amber got her cutie mark when she was in the second grade as the first fillies in her class. for any other filly it would be something to be happy about, however circumstances in which Amber’s cutie mark appeared are less than pleasant. every pony in her class was suppose to take part in a Heartwarming eve play and Amber was cast as one of the lesser unicorn characters. She had a terrible stage fright and during the final rehearsal she failed to sustain her magic hold on a sun prop she and two other ponies were suppose to raise. this caused the destruction of said prop and other ponies started to blame her for it. Then her special talent kicked in when she snapped and started to lash out at them revealing their secrets and things they felt guilty about. Very few ponies actually took her seriously dismissing what she was saying, and when her cutie mark – a broken mask, appeared everyone started to laugh that her special talent is the lack of talent and destroying plays. After this incident young Amber abandoned all attempts to approach other ponies and even actively pushed away those, who tried to know her or even talk to her. She was reading a lot of books and she was spending all her free time in her room to avoid others. As an outcast and considered a weirdo by other students she focused on the one thing she was good at – studying. since most of the credit points needed to graduate were awarded for magic-related classes Amber had to work twice as hard to get by. She took every additional course she could, which led her to discover enchanting, a course only she and three other ponies took. She soon discovered that her naturally low magic output was perfect for the delicate process of enchanting. Next year she took the advanced enchantment course, as the first pony in 5 years, and the year after that she choose enchanting as the main subject of her graduation project. She was also able to create few magic buffers and finally learns basic spells which helped her with advanced magic classes she had to take. As her understanding of magic grew and her resentment towards other ponies softened she was approached by a group of three fillies who wanted to study with her. their company helped Amber to overcome some of her depression and anxiety and even led to Amber developing her first romantic crush on one of the girls and explore her sexuality. Knowing that her crush is exclusively one-sided and fearing her newly realized bisexuality Amber allowed her friends to arrange a date. Since Amber still kept herself as far away from other ponies as possible, she was largely unaware how ponies her age acted and especially how active the night life of some of them was. Excited at first, she soon realized that her coltfriend wants much more from her than just holding hooves and hugging, and when she confronted him about it he tried to hide it, embarrassed and confused. misinterpreting his actions Amber became furious and broke up with him in front of his friends and refused to listen to him or anypony else. This outburst reinforced her weirdo status and caused her to retreat again. Throughout her whole life she visited only few places outside of Manehattan, but that changed during her last summer vacations before her senior year at the Academy. Since she was already a legal adult she didn’t need her parents permission to go anywhere and she spent over a month traveling Equestria. Her senior year was filled with research and work on her graduation project as well as desperate looking for few extra credit points. In the end thanks to her enchanting skills and hard work she passed final exams and her graduation project got the highest grade. Despite that Amber didn’t want to attend the graduation gala and dance that was planned for the senior year. however she was asked to provide technical support for the dance and assist the DJ hired for it. Despite some technical difficulties the dance was a success and Amber was left with very mixed feelings towards the white mare with blue mane. Returning home was a difficult experience for Amber. Her mother revealed that she already has few suitable stallions from Canterlot interested in marrying her. after a rather intense exchange of arguments Amber took her still-packed bags from her room and left her family’s estate. She arrived in Ponyville the next morning and stayed at her cousin’s farm for few days before renting an attic in ponyville and establishing a small enchanting service to pay the bills. Amber Drop is a very withdrawn and mistrusting pony, who got hurt a lot in the past. Because of this, she has problems making new friends and opening to them. In some situations, she can get outright hostile towards ponies who try too hard to get to know her. She wants to have friends, she knows she’s lonely and she hates it, but she has serious problems breaking through her mistrust. Her talents enable her to perceive other ponies’ subconscious emotional reactions, giving her a substantial advantage over other ponies in separating truth from lies and determining true intentions. It isn’t completely foolproof and has gotten her into problems in the past, but life experience has improved her ability to distinguish intentional falsehoods from miscommunication as well as her ability to hide just how much she is able to determine just from using her talents and listening alone. She tries to be a good pony and she despises her family for all the corruption, lies and false atmosphere of kindness she could see right through when she was a little filly. She didn’t understand it then, now when she does it fills her with disgust and fear that she might become just like them. However it’s not easy for her to control her powers and more often than not she learns much more about a pony than she is supposed to and she has been known to use that knowledge to her advantage.